A few more days and it's Christmas! I finally had time to do a Christmas nail art design. Hopefully I'll be able to do another one within the week. I'm keeping my fingers crossed! This freehand nail art is not fancy at all. It is a simple abstract design that mimics a pinwheel. And since it's Christmas, I just played around with the colors red and green. It seemed easy to do when the idea was still in my head. But working with a small canvas like our nails can deem very challenging at times. And not being able to paint my nails as often added to the challenge. 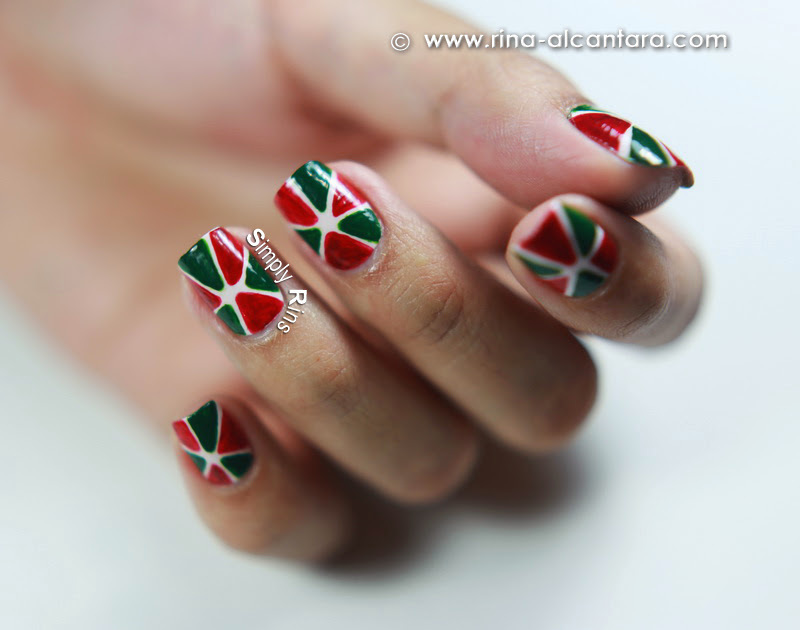 As I mentioned, I named this Christmas Pinwheel simply because it was the inspiration for this nail design. I know that the actual pinwheel would probably be more swirl-y. But we all know that curve lines are harder to paint on the nails. So perhaps I should have titled this "Christmas Pinwheel ... Sort of?" to be more accurate? The idea here is to paint small triangles all around the edge of the nail and leaving a small gap where all the triangles will meet. I alternated the colors of the shape between red and green. 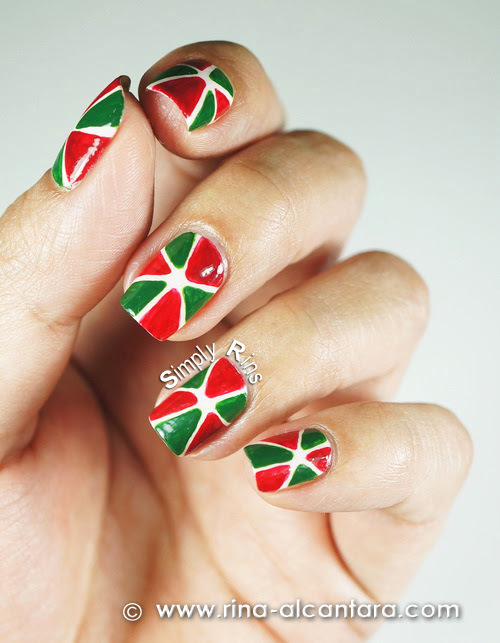 An option is to have one nail painted with all red triangles and alternate between nails with green. Come to think of it now, this probably is an easier way to this design! I used a neutral nail polish color for the base and a darker shade of red and green acrylic paints for the nail design. A white background would make this nail art bolder to look at. But if you like a more subtle or vintage effect, you may want to go for an earth tone base. Use a dotting tool with a very small ball tip for a more manageable painting of the triangles. Although a detailing nail art brush will give more precision, it is harder to control and can prolong the time to complete the design. Do NOT paint the triangles red and green alternately one nail at a time. That would be time consuming. If you started painting with a red triangle on one nail, go on and do the same with the other nails before switching to the next color. Make sure the acrylic paint you will use is opaque and has a very good consistency so that you only need to paint only 1 layer. Isn't it amazing that nail art needs you to be creative not only for the design but also on how you will execute the idea? I have been doing nail art for years and still I'm learning new things as I go along. I hope you like this simple freehand Christmas nail art design. Do you already have an idea how you'd wear your nails for the holidays? Perhaps some of my designs can inspire you. Just head over to my nail art gallery to browse my previous Christmas nail art ideas. Very festive and sounds easy to recreate! Merry christmas Rins! this is a cute design, i have to think of candy! !